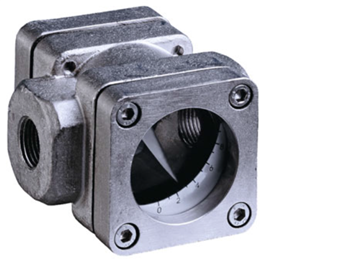 The DG06 flow indicator allows visual and quantitative monitoring of liquid flows. The device has two large glass panes – one on each side – and each with a scale attached. A stainless steel flap mounted in the flow chamber is lifted when there is flow and the current flow rate is displayed on the scale. The flap is mounted on a stainless steel shaft; it is raised by flow and lowered by gravity. The DG06 can be installed both horizontally and vertically (with flow from bottom to top) and deployed in a wide variety of applications – in part because it is not adversely affected by high temperatures.